We’re living in a Golden Age within the comic book industry. A Golden Age of new ideas and themes in comics. A Golden Age of talented creators with great stories to tell. A Golden Age where fans have no shortage of diverse offerings to keep their hunger for comic books satiated. And the creators contributing to such an Age? Afua Richardson. Brandon Easton. Ashley Woods. Brandon Thomas. Micheline Hess. Alverne Ball. Jason Reeves. Regine Sawyer. Chuck Collins. I could go on and on, but I suggest doing a Google search on these creators, and also heading here. Let me repeat this: we’re living in a Golden Age. Heck, look no further than the recent 2016 Glyph Comics Awards announcements and try to tell me that all of those creators and titles don’t keep you driven to read more great books, and to create your own awesome works of super heroics, or maybe even an everyday slice of life comedy/ drama. The folks at Scout Comics understand this. With the upcoming release of the relaunched SOLARMAN, they see that fans are looking for something new, and fresh. Something that will have them knocking down the doors on #newcomicswednesday. A book with a creative crew, and cast of characters that reflect not just one particular segment of the comics buying audience. Enter stage left SOLARMAN. Originally created under the Marvel Comics banner in 1989, the title is now undergoing a reboot for current comic book audiences, courtesy of publisher Scout Comics. The comic was originally written by Stan “The Man” Lee, creator of such acclaimed characters as Spiderman, the X-Men, the Fantastic Four, the Avengers, and a host of other popular Marvel properties. SOLARMAN creators David Oliphant and Deborah A. Kalman have teamed with Scout Comics, and a talented group of creators to bring SOLARMAN back to current audiences. The creative team for the series includes co-writer Joseph Illidge (former Batman editor at DC Comics/ writer of The Ren), co-writer Brandon Deneen (Flash Gordon: The Mercy Wars, The Island of Misfit Toys), Glyph Comics award winning/ Eisner award nominated artist N. Steven Harris (Ajala: A Series of Adventures, Batman, Deadpool, Catwoman), colorist Andrew Dalhouse (Titans: Rebirth, Faith), and letterer Marshall Dillon (Skullkickers, Airwolf). 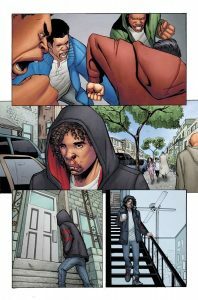 SOLARMAN creative team members Joseph Illidge and N. Steven Harris recently took some time to talk about the upcoming series, their working process as creators, and a few other topics. 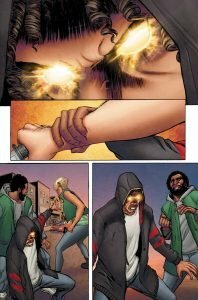 “The creators of SOLARMAN, David Oliphant and Deborah Kalman, felt this was a good time to bring the character back into the light. 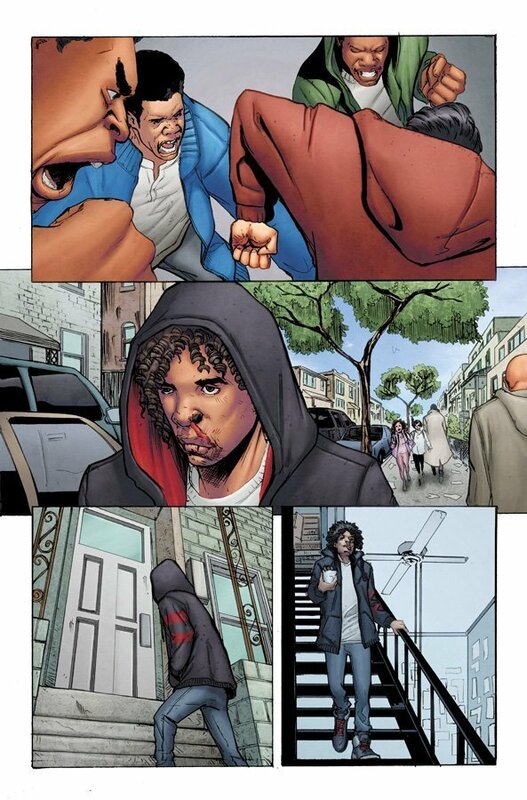 The character is a Black male teenager at a time in American society when that demographic is under undeniable assault by forces outside of the Black community and within it. Having a superhero representing that demographic, to some degree, opens up a lot of story and dramatic possibilities,” Illidge explained when asked about the relaunch of SOLARMAN. As mentioned before Scout Comics has composed a talented team of individuals, with a large collection of experience within the comic book industry. These talents have combined to bring Ben Tucker’s story to audiences, both familiar and unfamiliar with the SOLARMAN brand. “Co-writer Brendan Deneen is easy to work with on script, and is open to new ideas. Illustrator N. Steven Harris is a master storyteller, having worked on characters like Deadpool, Captain America, and Batman, to name a few. Steve is detail oriented, and applies thought to his work to the level that I see the multiple layers of his storytelling upon repeated views,” Illidge said. With working on such established/ licensed properties creators often realize that they are working on characters that aren’t necessarily their own. In many circumstances these writers and artists are given the freedom to play within the universes of these respective characters, with not many restrictions. In other cases though, there is a strong through line that has be followed, coming with a strong set of rules on what to do or what not to do with the property being worked with. Harris and Illidge explained that with the relaunch of SOLARMAN they were provided with minimal restrictions when bringing this character back to the forefront to today’s audiences. “Fortunately, any restrictions that I have had in my experience with DC Comics, Marvel, Voltron, or any other licensed property, were very minimal. Now, I have had nightmares with licensed characters with other companies. But that has not been the case here, or for most of my career. Now at the start of a project, I usually do sketches of the characters to get a feel of their look. However, with SOLARMAN, this was a total redesign effort, so the pre-existing history of SOLARMAN isn’t that of a Batman, Deadpool, Catwoman, or Voltron,” Harris explained. “SOLARMAN is David and Deborah’s baby, so they naturally have certain requirements. That said, the team and I have been afforded a lot of freedom, so it’s a good balance. Everyone’s goal is the same when it comes to the story of SOLARMAN,” Illidge said. Following on the heels of this Harris went on to expand further on how it felt to get an opportunity to help re-brand an already existing property. “Well I didn’t do much research of the old character. That wasn’t really intentional. Joe just got me started on some designs. 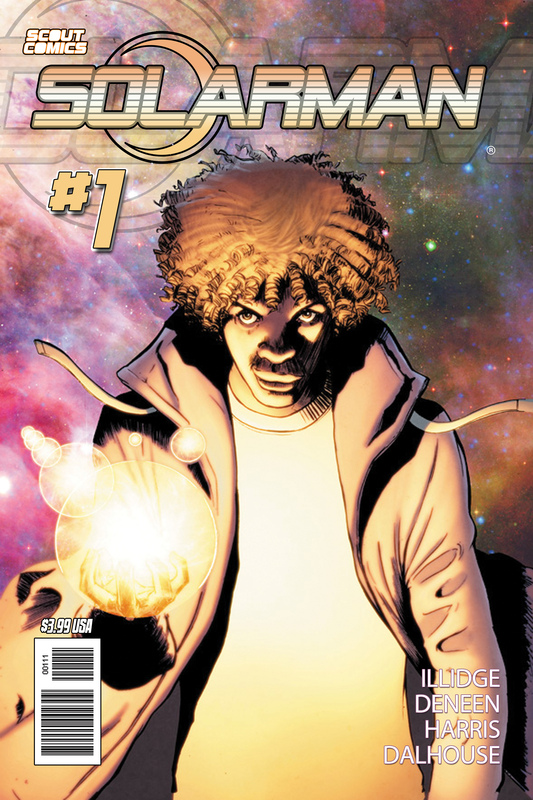 I took the idea of SOLARMAN, or Ben Tucker, being a bi-racial child and used that as a starting point. Then I considered his general situation and tried to show that on his face. Joe also wanted the character to have a particular and current fashion look or style,” Harris said. In today’s pop culture landscape audiences are used to seeing no shortage of “re-imaginings” or “re-beginnings”. Just look at examples such as the relaunched Star Trek, and James Bond franchises, or even the countless relaunches that Marvel and DC Comics take part in every year. In a field where reboots and relaunches are often the name of the game, both creators explained what they were attempting to bring to separate the SOLARMAN series from such re-brandings.